Several years ago, there weren't many options available to help treat spider and varicose veins. Surgery was often an option if you had severe, bulging veins, but there was little help for men and women who wanted a more conservative, preventative approach to vein health. Varicosamin was developed as a daily supplement to help support vein health. Developed by two board-certified vein surgeons, Varicosamin is a bioflavonoid-enriched supplement that provides effective daily support for patients with a personal or family history of varicose veins. Now you don’t have to wait for your veins to gradually worsen over time . . . Formulated with a powerful combination of Diosmin and Hesperidin, Varicosamin can help strengthen and support your leg circulation. WHAT IT DOES: Healthy veins are an important part of your normal circulation. The health of your veins depends on the function of the vein wall, vein valves, and the inner lining of the vein itself, the endothelium. The Bioflavonoids in Varicosamin act to support and strengthen the function and health of the veins in your body. It is the first defense mechanism against damage to our venous circulation. EXPERT DESIGN: Varicosamin was developed by two board-certified vein specialists (phlebologists) to harness the scientifically proven efficacy of flavonoid phytoceuticals in the prevention and management of chronic venous insufficiency. KEY INGREDIENTS: Diosmin and Hesperidin are isolated from a specific orange species (Rutaceaaurantieae) that is native to the Iberian peninsula and North Africa. WHY WE LIKE IT: Prevention is an important part of vein health. Years ago, there were few non-surgical options for abnormal varicose veins. 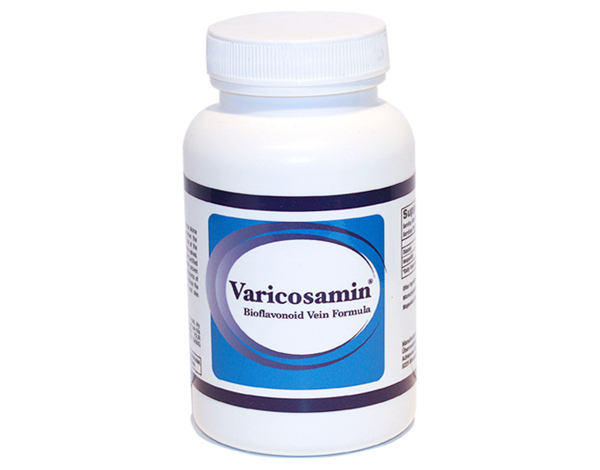 Varicosamin is formulated as a daily supplement for men and women who have a personal or family history of vein problems. Varicosamin is also recommended for patients who have symptoms of chronic venous insufficiency or who are currently undergoing a vein procedure. Packed with powerful bioflavonoids, Varicosamincan help strengthen your body’s natural defenses against chronic venous insufficiency, bulging varicose veins, and superficial spider veins. http://www.myveinstore.com/ - use Varicosamin daily to promote vein health or use it when you travel by car, bus, train or plane to reduce aching and pain related to leg swelling. This product is NOT a blood thinner and does NOT claim to reduce risk of getting blood clots during travel.